Need advice or want to share your wisdom? 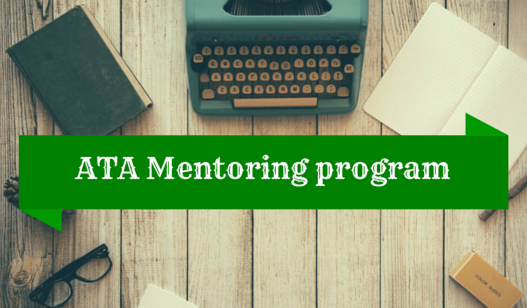 Join the ATA Mentoring Program! The Mentoring Program is an ATA membership benefit. 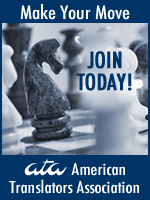 Any ATA member can apply to become a mentee; this is a valuable privilege many members don’t know they have. If there is some new skill you want to learn but don’t know how, this is a good place to come. ATA counts many talented translators and interpreters who are experts in a wide variety of fields, including literature and music, quantum physics, pharmaceuticals, law, and even hand-written historical documents. How to deal with medical interpreting or voice-over assignments is taught just as easily as time management or finding the perfect balance between work and home. The ATA Mentoring Committee will track down one of these experts to be your mentor and help you put the next piece of your professional puzzle in its proper place. The main objective of the Mentoring Program is to convey the business side of the translation and interpreting profession to the mentees. For this reason, we generally don’t pair mentees and mentors based on language. In fact, in most cases they will not share the same working languages. It is unlikely, therefore, that the mentor and mentee will get sidetracked by language-specific questions. Alternatively, you can also propose your own ready-made mentor-mentee pair. Mentees and mentors are matched once a year. The Program is limited to about 30 pairs. It’s a one-year commitment. Mentees are selected by a competitive application process that includes a short essay covering background, experience, and what the applicant hopes to achieve as a mentee. Mentees should have a solid amount of work experience. This allows them to be very specific about what they want to learn from a mentor and follow the advice given. Mentees are matched to mentors based on goals. They are never matched on the basis of working languages. Two to three actionable goals is ideal. Mentee goals must be business-centered. Learning how to pass the ATA certification exam is not an acceptable goal. Each member can participate only once. Therefore, mentees need to be able to make a one-year commitment. Anyone who drops out during the year will not be able to return during another year. Mentees may have been in the business for a number of years, but now want to explore something new with a mentor’s help; for example, adding CAT tools to workflow. ATA-certified mentees receive 2 CE points for the finished mentoring year. After their introduction, the mentor and mentee will decide jointly on the modus operandi of the mentoring year, which begins in April and ends in March. It is the mentee’s responsibility to drive the mentoring relationship; that is, to set goals, stay in touch with the mentor, and establish measurable milestones. It is the mentor’s responsibility to provide advice and encouragement. We have tremendous appreciation for our mentors who are volunteers drawn from the vast ATA membership. Translators and interpreters are artisans whose craft and business savoir-faire need to be not only honed but also shared. Like any other profession, the more accomplished members will retire sooner or later, and not necessarily because of age—and why not, since there are other things in life to explore, no matter how much we love our profession—and leave the younger members to carry on. As facilitators and transmitters of knowledge, mentors are an essential part of our profession. If you have the professional experience and the desire to be part of this heroic group, we would be delighted to hear from you. During this year’s ATA Annual Conference in Miami, the Mentoring Committee presented a session entitled “How to Be a Happy and Prosperous Translator or Interpreter.” We discussed the Mentoring Program in more detail, as we have done at past conferences, but also discussed our own experiences in some of the topics that are of interest to newcomers, such as getting a fair price for your work and keeping the passion for your career alive in spite of circumstances that may spoil it. For questions regarding the ATA Mentoring Program, please contact Cathi or Susanne at mentoring@atanet.org. Have you already participated in the Mentoring Program and want to share your experience? We’d love to hear from you!